Quality is of extreme importance to us; we devote extra attention to quality assurance and invest heavily in quality management systems. With our advanced in-house laboratories and Quality Control System, based on more than 20 years of experience, we ensure technically superior products, in compliance with the highest production quality standards. Since our foundation in 1995, we have been committed to meeting the highest quality demands. We always listen to our users and other stakeholders, and take the time to understand their requests, desires and expectations. We systematically engage our middle management and all employees in finding the best solutions. We have established a good foundation and a reward system for promoting new ideas, initiatives and innovations. Our efforts to ensure a clean environment and appropriate living conditions for future generations are merged into the environmental management system complying with the ISO 14001 requirements. We are aware that together with our business partners and the wider community, we are part of our society and the environment which we live in. Upgrades to new versions of standards align our processes with the requirements of the modern business environment. They help us focus on the added value not only for the organization and users, but for all stakeholders in our processes and chains (workers, suppliers, service providers, customers, institutions, communities). We are more than ever focused on results, which we measure with key performance indicators that represent the basis in our decision-making processes. We are aware of the management’s responsibility, and are stepping up our commitment to following the latest approaches and methods in our operations, and meeting the standards in place in the most developed business environments. We keep a close eye on the processes development and market trends in related industries, and respond accordingly. We try to perceive all the dangers, and avoid them where possible, so we implemented risk-based thinking into our decision making processes. We analyse all identified, predicted and possible risks in a risk register, which is also used to identify opportunities. Upgrading existing standards to ISO 9001:2015 and ISO 14001:2015 made their structure more coherent, and integration with other ISO standards easier, benefits of which we already reaped when implementing ISO 50001. Upgraded standards also create a good foundation for future alignment with the IATF 16949 automotive industry standard. Our advanced technology, development and quality processes, are moving in the direction of gradually implementing key project management tools PPAP and APQP. Strip’s and its products are in compliance with all applicable European Union directives and regulations. These directives are mainly aimed at protecting the environmental, as well as consumer health and safety, and they apply to everything from supply and manufacturing to application and procedures after the expiry of the product’s lifetime. 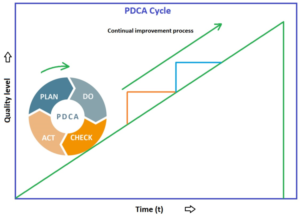 PDCA (plan–do–check–act or plan–do–check–adjust) is an interactive four-step management method we use in business for the control and continuous improvement of processes and products. 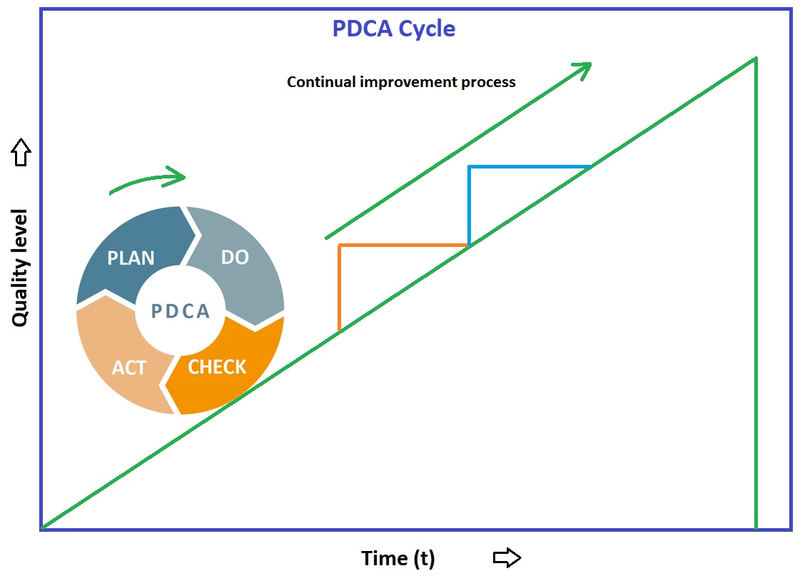 Just as a circle has no end, the PDCA cycle should be repeated again and again for continuous improvements in our company. Implementation and supervision are assured through regular meetings and participation of members from company’s top management. We use the 5S system in order to improve workplace efficiency and eliminate waste. 5S is a systematic method used to improve our organization and standardize our processes, making them more efficient and less stressful for our employees. We went a step ahead and implemented lean 6S methodology, putting additional emphasis on safety. We systematically monitor order and cleanliness according to the 6S methodology in all stages of our processes. We believe that this methodology makes us reliable, settled and trustworthy for our employees and business associates. 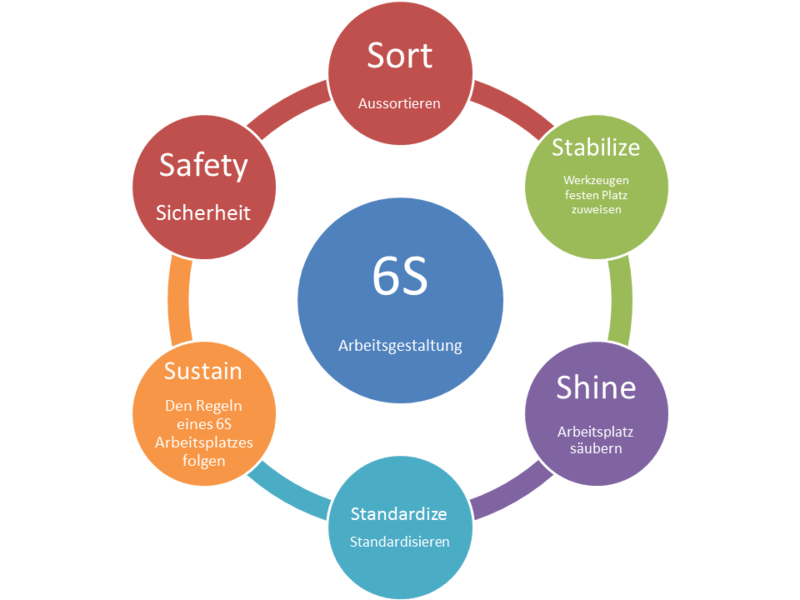 The 6S method increases workplace efficiency, improves maintenance and safety, reduces storage space, helps decrease waste, and consequently increases the quality level. We have been successfully optimizing our material flows and processes using LEAN methods for several years. We started reducing system documentation and began unifying forms. We defined the standardized outputs from the information system, and began storing documents in electronic form. Our next step is implementing analytical approach with optimisation methods.